To imitate the segmented bodies of quill body flies, you can use materials such as moose mane, stripped peacock herl, regular nylon thread and porcupine guard hairs. Patterns such as the Quill Gordon, Blue Quill, Mallard Quill and a quill body March Brown are effective patterns. Nylon thread is by far the quickest and easiest method because all you have to do is tie in a four inch piece of white 2/0 nylon. Then build an even body with black 3/0 monocord and, depending on the size of fly, wind the nylon forward about four to six times. The fragile body should be cemented for maximum protection. Stripped peacock herls make natural body segments, but the process is more involved. 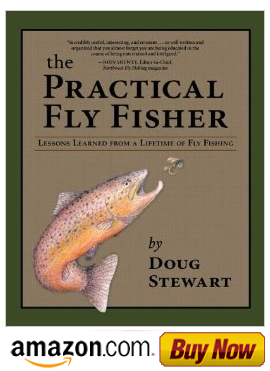 If you’re tying fewer than a dozen flies, use your fingernails to remove the herls by stroking back against the grain of the shaft. You can also use an eraser or the edge of a razor blade. If you’re tying more than a dozen flies, a solution of 20 percent Clorox and 80 percent water will strip the quill in a few minutes. This is called burning the flue. When cleanly stripped remove the treated herls with tweezers and allow them to dry. If the solution is too strong, or if you don’t soak the herls in water before tying, they will be too brittle. If you decide to use moose mane, select a light and a dark hair fiber and tie them in together, tips first. Then spin them forward, alternating colors as you go. If you decide to use porcupine guard hairs, they should also be tied in tips first and spun forward to complete the body. Porcupine is more durable, more realistic and floats the fly better. Speeding Up the Fly tying Process. How to Wade Safely when Fly Fishing. My big fish turned out to be a tarnished trophy.